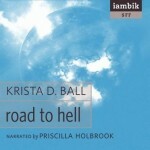 SF Canada member Krista D. Ball is pleased to announce the release of the audiobook version of Road to Hell, just out from iambik audiobooks. The audiobook is narrated by Priscilla Holbrook. For more information on the print version, click over to Mundania Press.